* Admit Cards can be viewed and printed by individual applicants from www.bup.edu.bd on: 20 October 2017 onwards. (1) A candidate must pass SSC/equivalent and HSC/equivalent examination in any discipline/group. (2) Candidates of Science Group must have GPA 4.50 in SSC/equivalent and GPA 4.25 in HSC/equivalent examination. (3) Candidates of Business Studies Group must have GPA 4.25 in SSC/equivalent and GPA 4.00 in HSC/equivalent examination. (4) Candidates of Humanities Group must have GPA 4.00 in SSC/equivalent and GPA 3.75 in HSC/equivalent examination. will not be considered in point calculation. (9) Candidates applying for Department of Disaster and Human Security Management must be qualified from science group in SSC/equivalent examination. Candidates must have studied Higher Mathematics/Statistics in HSC/equivalent examination and obtained minimum ‘A-’ (A Minus) grade. (10) Candidates applying for Department of Development Studiers/Public Administration/Sociology as first choice must answer Bangla, English and General Knowledge of the question paper. (11) Candidates applying for Department of English must have minimum ‘A-’ (A Minus) grade in English both in SSC/equivalent and HSC/equivalent examination. Candidates must answer Bangla, English and General Knowledge of the question paper. (12) Candidates applying for Department of Economics must have minimum ‘A-’ (A Minus) grade in Economics/Accounting/Statistics/ Higher Mathematics either in SSC/equivalent or HSC/equivalent examination. Candidates of ‘O’ Level and ‘A’ Level must have minimum ‘C’ grade in any of the above mentioned subjects. (3) Candidates of Humanities and Business Studies Group must have GPA 4.25 in SSC/equivalent and GPA 4.00 in HSC/equivalent examination. (1) A candidate must pass SSC/equivalent and HSC/equivalent examination in science discipline/group. (2) Candidates must have GPA 4.75 in SSC/equivalent and GPA 4.50 in HSC/equivalent examination. (6) Candidates applying for BSc (Hons) in Environmental Science must have Biology in HSC/equivalent examination. (7) Candidates passed ‘O’ Level/equivalent and ‘A’ Level/equivalent examination from abroad need to obtain “Equivalence Certificate” from equivalence committee of respective faculty, before applying. (3) Master’s Degree holders will be rewarded with 1 (one) additional point. (4) Applicants who have appeared at ‘O’ level examination must pass at least 05 (five) subjects with minimum ‘C’ grade in each subject. (5) Applicants who have appeared at ‘A’ level examination must pass at least 02 (two) subjects with minimum ‘C’ grade in each subject. a. Transactions can only be done using Personal bKash Account. b. 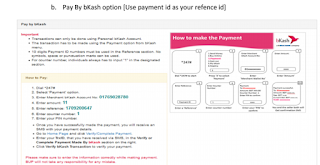 The transaction has teo be made using the Payment option from bKash menu. c. 10 digits Payment ID numbers must be used in the Reference section. No symbols, space or punctuation marks can be used. d. For counter number, individuals always has to input ‘1’ in the designated section. * Once you have successfully made the payment, you will receive an SMS with your payment details. * Enter you TrxID that you have received via SMS in the verify or complete payment made by bKash section on the right. 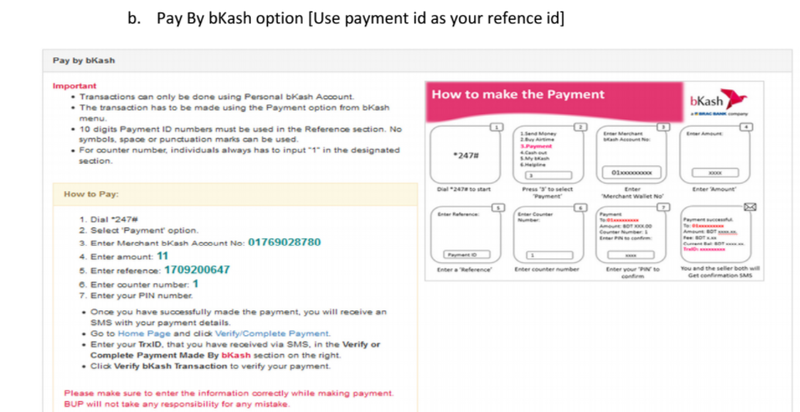 * Click verify bKash Transaction to verify your payment. BUP Admit Cards can be viewed and printed by individual applicants from www.bup.edu.bd on: 20 October 2017 onwards. BUP Seat Plan can be viewed and printed by individual applicants from www.bup.edu.bd on: 20 October 2017 onwards. 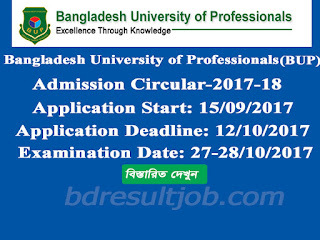 Tags: admission bup edu bd, bup edu bd, Bangladesh University of Professionals (BUP) Admission circular 2017-2018, BUP Admission circular, BUP Admit card download, BUP seat plan, HSTU admisttion test mark distribuition, Bangladesh University of Professionals (BUP) Admission test result 2017. 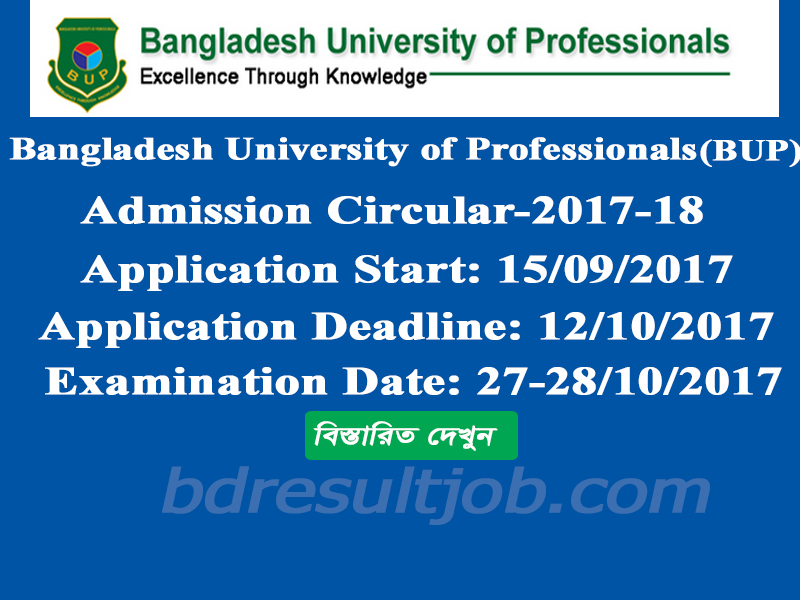 Bangladesh University of Professionals (BUP) Admission circular 2017-2018,BUP Admit card download, BUP seat plan, HSTU admisttion test mark distribuition, Bangladesh University of Professionals (BUP) Admission test result 2017.